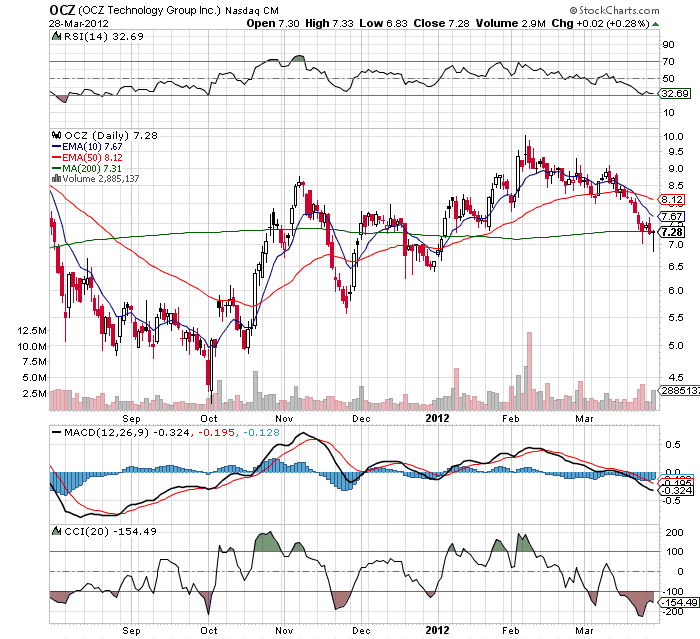 At one point today, OCZ Technology (OCZ) was down more than 5% to below $7 before a massive end of day rally. This stock has been a major conundrum since completing a secondary at $9 to raise over $100M. The stock even hit $10 around that time. Even worse is that the market has been consistently rising during that period. Management had previously hinted that if the company needed to raise cash it would be due to significant orders that required more cash for operations. Absent any big deal announcement since the secondary, it appears that investors have become disenchanted with this story. Analysts expect the company to have wrapped up nearly 100% revenue growth for FY'12 and follow that up with a 35% revenue growth for FY'13. The stock currently trades at a 13 forward PE though the 5 year growth rate is over 22%. That number even appears low considering the growth rate. On the technicals, the stock closed right around the 200ma. Being so oversold, the stock is due for a rebound. The question remains whether this flash storage provider will soar or fade away. Down 4% today so apparently the strong close was just speculation over the earnings call announcement after the close. Traders didn't get any hoped for positive news so back down goes the stock.